"This simple Vietnamese salad is great for a hot summer night. The tart flavors of the onion, lemon, and salt are offset by the cabbage and chicken." 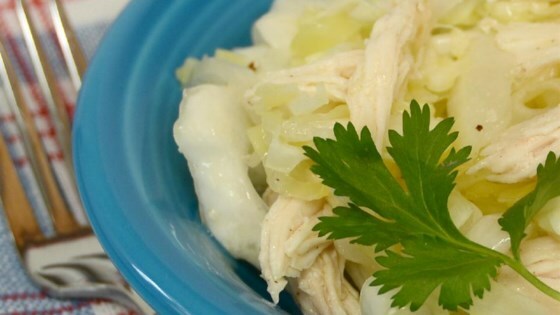 In a large bowl, toss together the cabbage, onions, and chicken. Toss with olive oil until everything is lightly coated. Season with salt and pepper and continue to toss while adding lemon juice. Add enough lemon juice so that you can taste it in every bite. Cover and refrigerate for at least 4 hours before serving. The longer it sets the more the flavors mesh together and the better it tastes! I did not care for this recipe. A big disappointment. This is a good basic recipe. I customized by adding some fish sauce mixed with water, garlic, sugar, olive oil. Everything else in the recipe stays the same. This recipe was really quick and very delicious.